Want a Free Star Wars Book? GeekBoy May 3, 2008 May 3, 2008 Comments Off on Want a Free Star Wars Book? Would you like a free book? Of course you would. I do. Well, between now and May 13th, to celebrate the pending release of Invincible, the final chapter in the Star Wars: Legacy of the Force series, Random House and Del Rey are letting the general public download a FREE audio or digital version of Betrayal, the first book in the series. 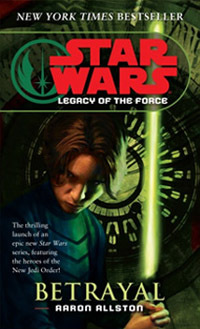 Spanning 9 volumes, the Legacy of the Force series deals with events that occur in the Star Wars universe starting roughly 40 years after the original trilogy of movies (Episodes 4-6). Luke, Han, and Leia are back, but much older now, and they all have kids. And one of this new generation has not quite lived up to the standards established by his/her parents. Yes, you guessed it — somebody gets seduced by the Dark Side. And yes there’s a war. And yes … there is a Big Bad Sith Villain behind that war, a student of Darth Vader, who needs to be taken down.